Preparing. 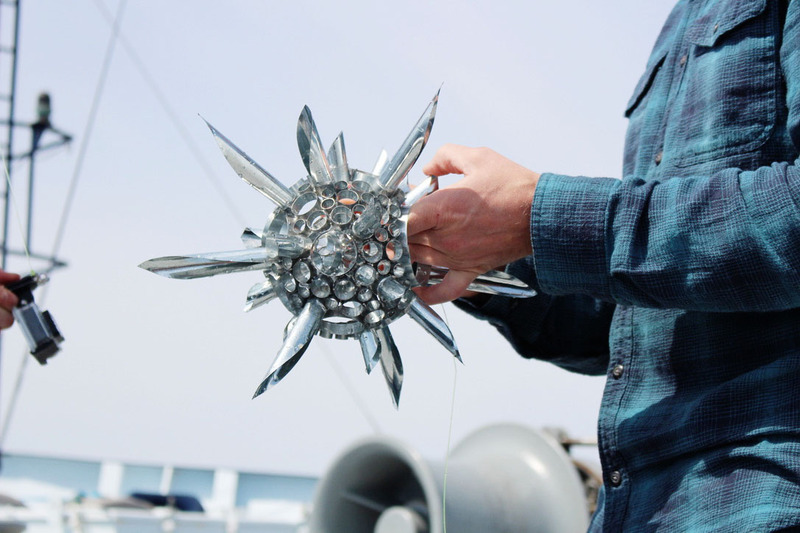 As the days passed by and I started to settle into the transit cruise, there was a looming stressor: deploying the sculpture in order to obtain video documentation of the work submerged at sea. The sculpture, a gopro camera, and a small weight (keeping all elements in alignment) is a relatively simple rig to assemble, but the prospect of potentially losing everything to the deep made me doubt (and quadruple check) every element – from formatting memory cards, to the strength of the soldered joints, and the half-blood knot used on the 65lb test fishing line. 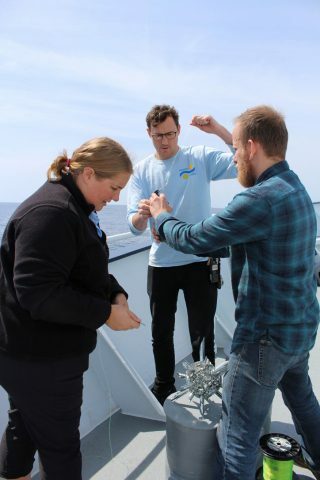 The day of deployment, while setting up the rig on the painter davit (small crane arm off the starboard bow), my stomach was busy performing an acrobatic tumbling routine while I prepared all of the components with the help of the ship’s Marine Technicians and the Second Officer, Tony McCann. When it came time to lower the sculpture down to the water, I found it hard to let my last finger go off the fishing line – everything was on the line, quite literally! Fortunately, all of the preparation and expert advice from the crew paid off. The metalwork, knots, camera mounts: everything worked as planned and I felt the anxiety begin to wan. Seeing the glittering metal form lower beneath the waves shifted the feeling in my stomach from one of anxiety to a sense of exhilaration and accomplishment. The rig was holding well and managed the ship’s heaves and rolls with no problem. With time between deployments I could not help but think about the level of stress and anxiety involved with sending out a multimillion-dollar ROV. Will the seals hold? Are all of the cables connected properly? Will the crane A-frame handle the load steadily? What are the known unknowns? How can you prepare for the unknown unknowns?? 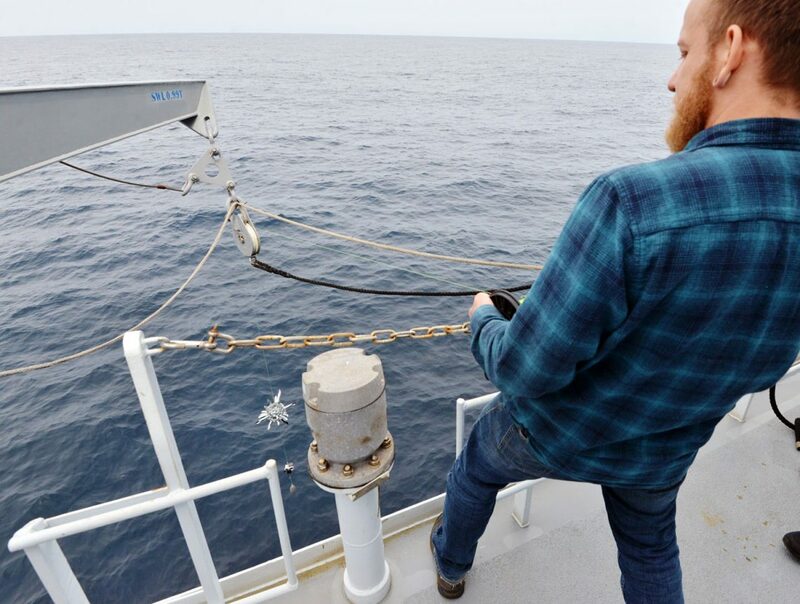 The crew of the R/V Falkor have the calm of repetitive practice and experience, but I wonder what sort of unseen aerial maneuvers their stomachs perform on major deployments. After approximately 45 minutes and four separate deployments, the documentation was complete. The sun came out just as we were setting up and provided excellent surface illumination and underwater visibility. 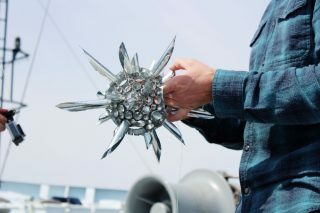 On the last drop on the port side, at a depth of just over 10 meters, the ship’s gondola (housing the sensor array) and the bulbous bow were in clear view behind the shimmering form of the abstracted radiolarian. Mounted to a rolling barrel swivel, the sculpture and camera spun between periods of calm and repose. I am incredibly happy with the contrast of activity, and look forward to utilizing the recordings to both illuminate future work and preserve this moment of observation and reflection. The remainder of the cruise has been filled with video editing, further documentation, absorbing all of the information I possibly can from the knowledgeable crew, and of course, completing the sculpture with the addition of colored glass elements. 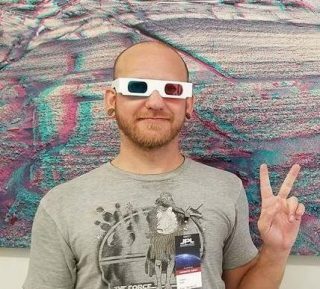 The insight gleaned from the process and products of multibeam bathymetry has helped to both hone and expand concepts that I have been working with, as well as open the door to a whole new toolset. I can not express enough just how incredible and influential this experience has been. 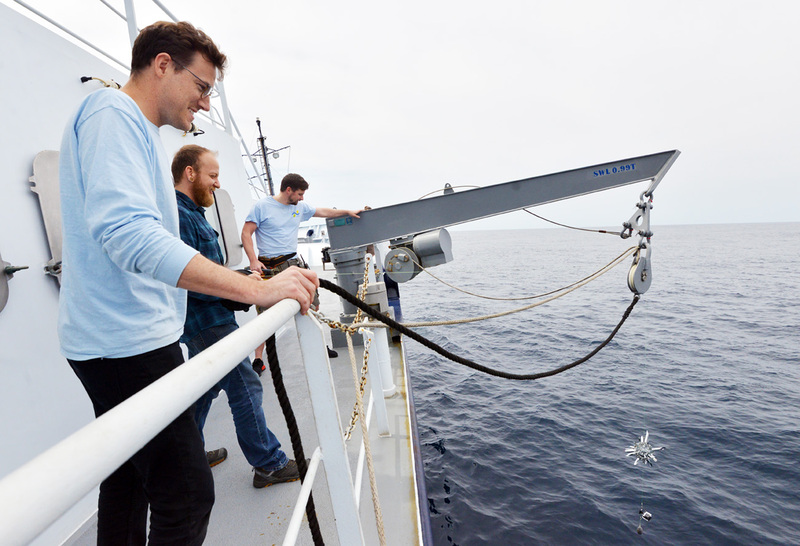 Thank you to the Schmidt Ocean Institute for this opportunity and to the crew of R/V Falkor for their kindness, hospitality, and valuable insight!